SunSetter Awnings is the top producer and seller of awnings in the nation. The company has been making their popular products, like their iconic awnings, along with outdoor rugs, hammocks, gliders and flagpoles, since 1988. SunSetter Awnings are available in six models with a range of color choices that make each type customizable. According to the SunSetter website, the Motorized and Motorized XL models are the company’s top sellers. Both models provide awning-style shade on demand. When not in use, the shade is rolled into a mounted holster. Electricity is required for the motorized features to work. The models come in various sizes, and includes a remote control. The Manual VISTA awning provides the same protection from the elements as the motorized versions, but electricity is not required. A hand crank lets users extend or retract the awning. SunSetter’s Model 1000XT awning was built for larger areas. It uses the same manual technology as the VISTA model, but because of the large size, the Model 1000XT is supported with vertical arms. The only difference between the 1000XT and the 900XT is that the 900XT is smaller. Both models can be customized with an optional screen room. SunSetter also makes freestanding awnings. The Oasis was designed to be used in backyards, decks, pool areas, or anywhere else a traditional awning cannot be mounted. It comes in two sizes, and shoppers have the choice between manual and motorized versions. Keep in mind, the motorized version will require electricity. A 24 ft. power cord is included with the motorized model. Shoppers can choose between woven acrylic or laminated fabric. The acrylic fabric is water-repellent and resists fading. The laminated fabric is fade, mildew and fire-resistant, and waterproof. Both choices come in a range of color and pattern options. Potential buyers can request up to three free fabric samples to help make the decision easier. Most models allow further customization with add-on features, like dimming LED lights, protective aluminum hoods, weatherbreakers, panels, patio lights, covers, cleaning kits and mats. Each awning comes with a 5-year limited warranty, and an All Weather Warranty can be added for an additional fee. SunSetter offers a 90-day home trial. SunSetter also carries a variety of outdoor products, like grills, hammocks, and flagpoles. 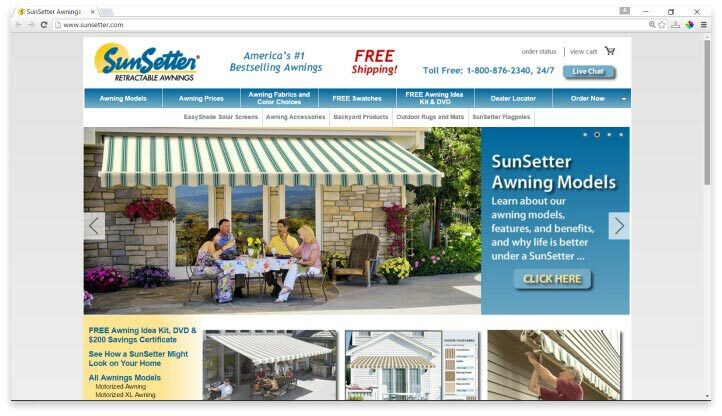 SunSetter awnings can be purchased online, or through local dealers. Some wholesale clubs also offer outdoor products from the company. SunSetter awnings get stellar reviews from customers. Most say their awning was installed within two hours of the technician’s arrival. They note how it keeps the area much cooler, including the part of their home that is attached to the product.. There are some complaints about SunSetter awnings. These are for several reasons. One, some users complained their motorized awnings failed within a short time period. And, two, Some were perplexed at the angle their awning was hung by the technician, stating it didn’t keep the sun out. The lack of customer service help for the former complaint was also noted by the individuals. SunSetter Awnings is the top producer and seller of awnings in the nation. SunSetter Awnings are available in six models with a range of color choices that make each type customizable. It seems that the nation agrees, SunSetter is a lot of people’s first stop when they’re shopping for awnings. The company has built a solid reputation over the years, with minimal bad experiences reported online. A variety of models and fabrics make finding the right awning easy. Have you had an experience with this company? Please share your SunSetter reviews below.